A Quilters Mind Never Stops Thinking! Just only a few moments ago this afternoon, I finished hand sewing the binding onto the Gumnut Babies Quilt – escaping with only a few needle pricks and my sanity still in tact! Tomorrow I will label and photograph it, share here with you on my blog and then pass it on to the lucky lady who gets to snuggle underneath it’s warmth and comfort. 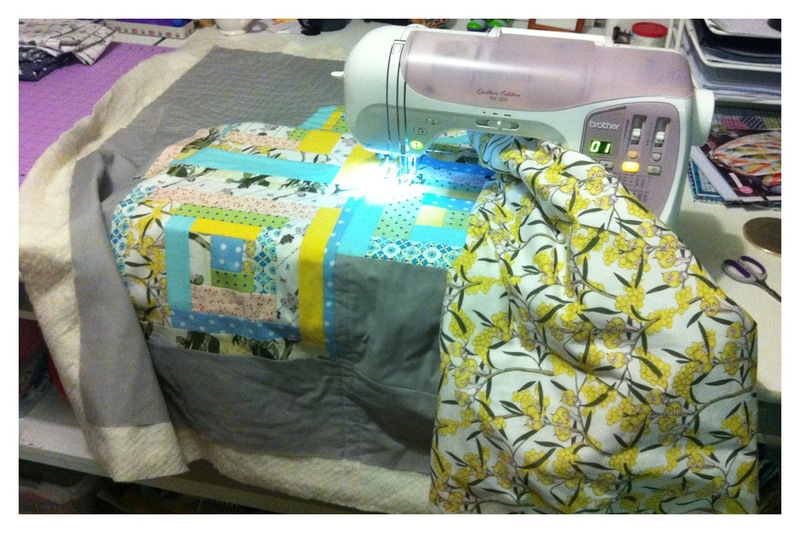 Here is the quilt being quilted during the week. I had fun playing around with the composition of the quilting lines to tie in with the modern approach I took to making this quilt. Obviously you’ll be able to see the final result when I photograph it tomorrow. I’m genuinely happy with how this quilt has come out, especially when I wasn’t following a pattern; it turned out exactly how I pictured it in my head and that, in itself, is refreshingly satisfying! The quilt top I’ve made for the How Does Your Grow? Competition has been finalized and yesterday I embellished the quilt backing, cut the batting down to size and basted all three layers together. 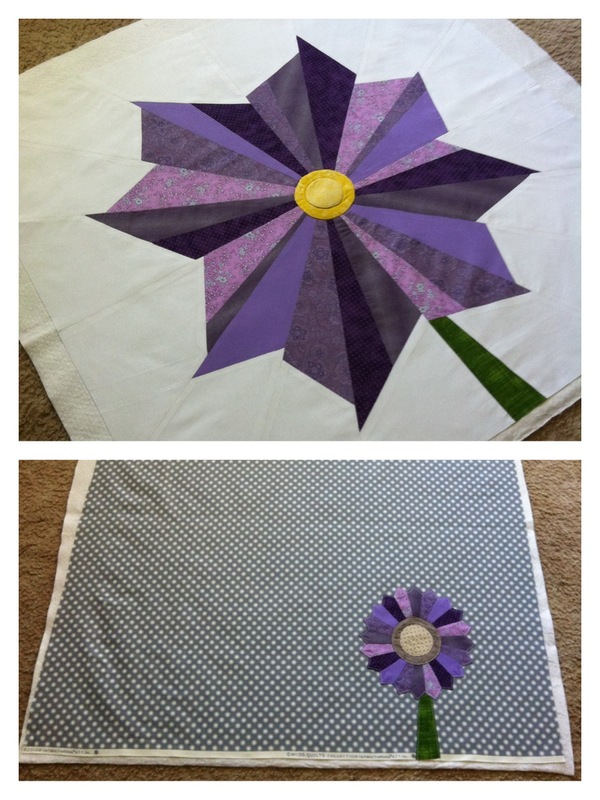 The next step now is to decide how I’m going to quilt it so I can fully emphasize the overall design and message of the quilt, as well as to highlight the hand pieced flower blades. So, now that these two projects are nearing their ends, it’s time to start thinking about the next few quilts that need to be made! I love planning and starting new projects; there’s such joy and excitement in choosing the right quilt designs, fabrics and quilting patterns! Within the past few months I’ve seemed to become addicted to solid block colours and have a few quilt designs in mind that, I think, will show off the harmonies between certain colours. I was recently inspired to use a particular colour palette after watching the highlights of the 2011 Dew Tour on Fuel TV. I love the bright and vivid lime green that’s smattered around the Skate/BMX course and how the greys and black sit comfortably next to each other. 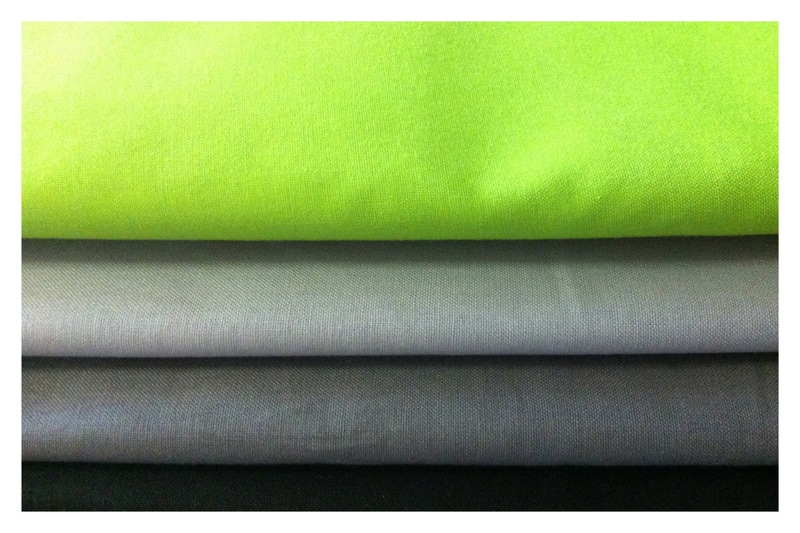 These aren’t the best pictures, but you can see what I mean about that intense lime green! So naturally I thought that those colours would look awesome in a quilt! I think the fabrics I bought match very well with the course’s colours and I plan to re-visit the notion of the ‘modern approach’ that I used with the Gumnut Babies Quilt, but with a different design of course! It’s amazing how inspiration can be found anywhere along with how it hits you like a ton of bricks when it does! 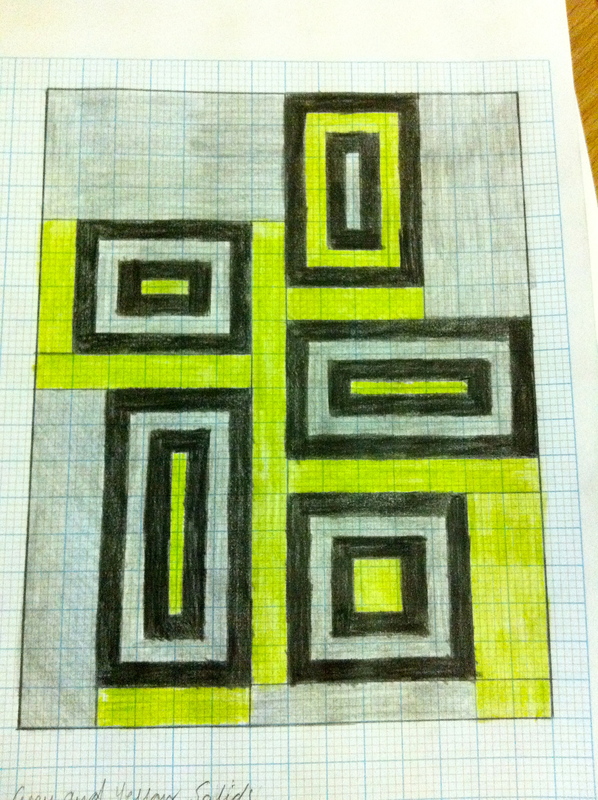 Another project that has sprung to mind is taking the opportunity to explore the use of negative space in a quilt. This thought came about after receiving an email from the organizers of QuiltCon (Texas, 2013) about the different categories that can be explored for the Quilt Show that they’ll be presenting. 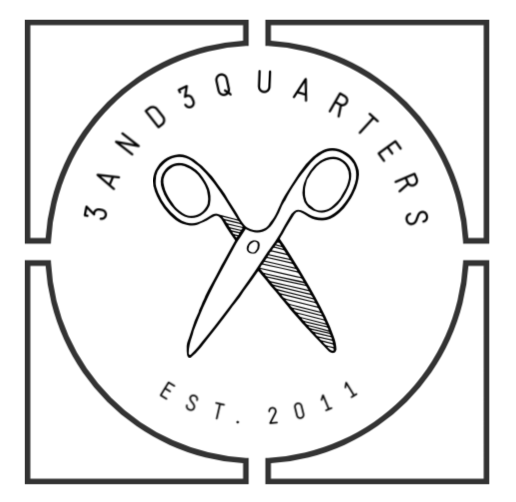 Entry is open for international quilters, so I’m thinking why not try my luck and make something that could be chosen for display! You never know these things unless you try! 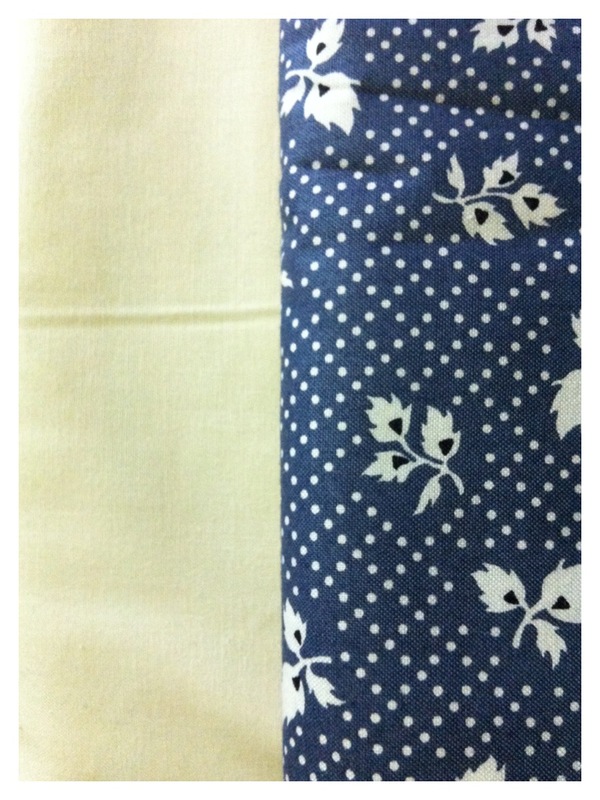 These are the two fabrics I’ve chosen to use; purposely paired for the minimalistic design I’m working on. I’ll update more as things progress! 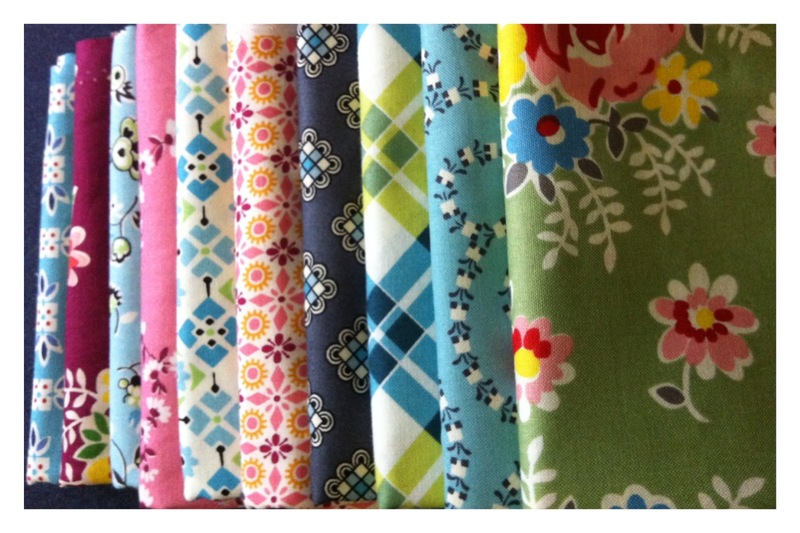 I’m also dying to find the perfect quilt project so I that I have an excuse to use these Denyse Schmidt fabrics that I oh-so love! They’re just sooo pretty and fun!! I think I’ll have to spend some time this researching quilt patterns, waiting for the right one to jump out at me and inspire my mind! Previous PostA Modern Approach Next PostSunshine Failure & Magazines!